Zeno watches begins in 1868 with watchmaker Jules Godat, founder of a small pocket-watch manufactory in La Chaux-de-Fonds, in the heart of the Swiss watchmaking region. He produced very small quantities of ladies' pendant watches and fine pocket watches with solid silver cases. The factory he built was taken over by the firm of Eigeldinger & Fils in 1920. Eigeldinger, a family business, specialized in wristwatches for the army. It made watches in stainless steel, silver, gold and platinum, with mechanical movements up to 43mm. Its registered brands were ZENO, STRAND and SOLVEX. The Zeno label, which was introduced by Andr�-Charles Eigeldinger, the owner's son, took its name from the Greek philosopher Zeno and the word "Zenodopolus", meaning "gift of Zeus" or 刧od given". The first ZENO watches were made in 1922, each piece marked with a Swiss cross on the back of the case. The company has continued to introduce innovative watch-manufacturing techniques ever since. ZENO watches were first exhibited at the Swiss Watch Fair in Basel in 1949. Wholesalers Dr. Peter Atteslander and Eric Enggist bought the rights to ZENO in 1966, selling them on to Felix Huber in 1973. Mr. Huber had been working for the company since 1964. Our workshops gained international attention in 1969 with the legendary, futuristic "Spaceman", the "Compressor" vacuum diving watch, and the takeover of several well-known Swiss watch factories. But the timeless star of the ZENO line is the famous "Pilot Classic" Collection (40mm). A contemporary variation on our pilot watches launched in 1965 (37mm), today's models not only compare very favorably with the original vintage ZENO Pilot Basic. Their state-of-the-art technology undeniably gives them the technical edge. Today ZENO watches are produced by one of the last independent Swiss watch manufacturers, a company with a long tradition of fine watchmaking: ZENO-WATCH BASEL. 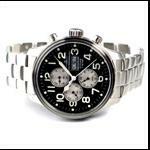 Zeno watches are in the low price range, and offer fantastic value. They make a very nice reproduction of the Rolex Bubbleback and Explorer I, and also several watches with a strong resemblance to Panerai. Customer service is available from 08:00 hrs to 18:00 hrs UTC Monday to Friday by voice or 24 hours by fax.